Join the discussion on our forums! Come discuss Omega Mind over in our dedicated Omega Mind discussion topic. Has a side-business selling her lipstick shade, "Omega Red." I'm disappointed in the lack of blue alien references in this comment section. This card is absolutely busted in arena when combined with Crackling Doom. Destroy the board and full heal, with enough mana left over to play an 8-drop with the sole drawback that you have 10 overload the next turn. Let them over-extend on a single turn and then nuke everything, and this skipped turn is a tiny cost. This, Into Elektra, Into Volcano/Lightning Storm and you enjoy a free Reno. Hallazeal the Ascended was my favorite Legendary back when I first started playing,I'm happy to see the spirit of that cart's effect still lives on :3. Let's go Control Shaman! 10 mana not much of a restriction, Just comes out 3 turns later than you might want it too... But idea is you use Healing Rain to survive to turn 10 and then this guy to heal even more with Lightning Storm and/or Volcano. An okay card. It could see play in control and combo decks but right now Shudderwock Shaman doesn't need it because of Lifedrinker. It could see some play in midrange decks as well. It sounds great on paper and could save a match in sticky situations (it won't save you from aggro decks though) but it's very situational. Oh my God! They are really making an elemental (WoW type) shaman a thing! 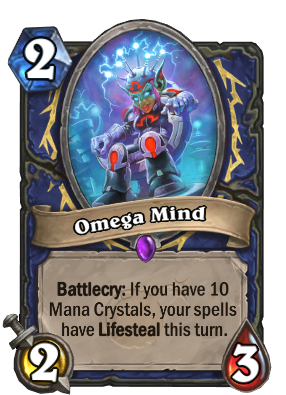 Turn 10 and everyone after him is Shudderwock turn, why don't even do a Omega card to Shaman? To be more precise, this card does have potential to create more healing than Healing Rain If the opportunity is ever present. Play it with Volcano and that is 15 health instead of 12. But that does mean this card is more restricted to specific metas whereas Healing Rain is more open in use. So put simply, it is not without potential. Just not as likely to be used. Elemental Destruction digs this card.